Over the past 15 years, Westcreek Pub Owners husband and wife Dieter and Jill Gesell have collected a lot of memories. “There’s too many to count,” said Jill. Their pub has hosted fundraisers, a wedding birthday parties over the last decade and a half. They know of at least 10 couples who met at the pub over the years and are either married or still together. One memory that stands out to Dieter comes from a few years ago when they hosted Shave Your Lid for a Kid. It was the largest fundraiser they have hosted. “We had about 15 people in that shaved their heads for kids’ cancer,” he said. 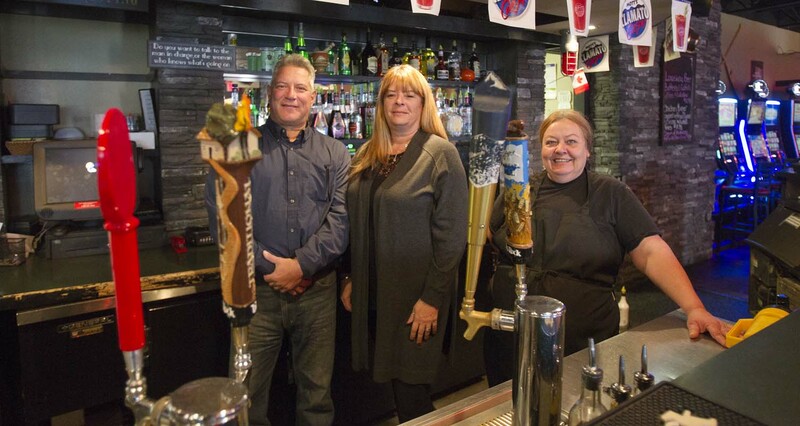 The couple opened the pub in 2001 when Chestermere’s population was only 3,600 people. “There were…two establishments, us and the Landing,” said Dieter. As Chestermere grew from a town into the city, he said they have had a lot of support from residents. They have had regular customers since they opened said Jill. “We’ve had kids have their 18th birthday party here and now 15 years later they’re bringing their kids in on the dining room side,” said Dieter. Nothing illustrates that community support as well as the time the power went out and customers parked their vehicles outside the windows with the lights on so that the pub could stay open. “It wasn’t out for that long, the beer…warmed up a bit,” he said. Jill credits their success to the fact that they are family run. Their son, who is 16, works in the kitchen. They are the old fashioned kind of family business said Dieter the whole family works there. “Mom and dad are out front and the kid works in the kitchen,” he said. The Gesell’s have lived in Chestermere for as long as they’ve owned Westcreek Pub. Going forward Westcreek Pub is moving towards more of a sports bar feel. There will also be a new menu rolled out in the new year. “We still want to be the neighbourhood pub,” said Dieter. “We cater to everybody,” he said. They are also looking to innovate on environmental sustainability by working on some technology in the kitchen to recycle some of the heat that is created to be used in the dishwashing. “We want to be…one of the first pubs that’s environmentally friendly,” said Dieter. To celebrate 15 years, they are hosting a customer appreciation night with a complimentary buffet on Oct. 22 at 7 p.m.
“Come and help us celebrate 15 years of business in this great city,” said Dieter.